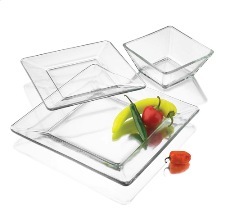 Glass dinnerware can be quite elegant for dining or entertainment. Glassware is also preferred by many for everyday use and chefs love it too. If you are interested in unique dinnerware made from recycled glass, I suggest you check into the products distributed by Viva Terra. Their vision is to produce earth-friendly products using passionate artisans. The result is exceptional dinnerware that you just don't see everywhere. I think it is totally amazing. Arcoroc dinnerware is also a great brand that produces dinnerware, glassware and flatware. Finnish glassware by Iittala is very unique. Colin Cowie is a world-wide renowned wedding and event planner. He often chooses glassware for celebrations and he makes lovely table settings. His gold-trimmed textured glass set is simply stunning. Engraved wine glasses are also great for formal dining experiences. They make wonderful gifts as well and can be personalized for added appeal. A lot of vintage dinnerware featured colored dinnerware made from glass. The Fire King brand made by Anchor-Hocking has to be my favorite. Jade-ite Restaurant Ware is without a doubt the most popular among collectors. Personally, I like the Peach Lustre dinnerware. The Rainbow pattern is also appealing. Federal Glass Company is another producer of vintage dinnerware including depression glass which is also popular for collectors of glassware. For everyday use, clear dinnerware is very trendy. Libbey Dinnerware is pretty awesome for day to day serving. The company manufactures both round and square dinnerware sets. I like clear glass because it is very versatile when it comes to decorating and making seasonal table settings. You can add color to the table by using colored serve ware, a centerpiece and a tablecloth or placemats. Many chefs prefer white dinnerware or clear dinnerware because it doesn't compete with the food on the plate. 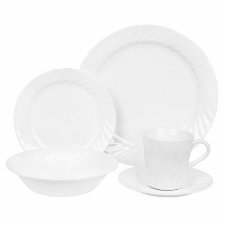 Corelle Dinnerware is ideal for everyday use. It is made of layers of glass that are thermally bonded and glazed for strength and durability.